Nvidia, on pace for its worst month in more than a decade - with shares down more than 27% in October alone - rose more than 9% on Tuesday after JPMorgan upgraded the stock to overweight from neutral. Shareholder Josh Brown continues to like the stock’s long-term story, and believes the pullback is an attractive entry point. It's been a rocky October for chip stocks, with the SMH, an ETF that tracks the sector, falling more than thirteen percent month-to-date. One of the hardest-hit names is Nvidia. It's down 27.76% so far this quarter, and is set to post its worst month in more than a decade. But on Tuesday the stock got a vote of confidence from JPMorgan, which upgraded the Santa Clara-based company to overweight. In a note to clients, analyst Harlan Sur wrote that the company's long-term growth potential in different markets, including cloud datacenter and autonomous driving, makes it an attractive stock to own. Sur did lower his target from $265 to $255, but that still represents a 25.6% upside from Tuesday's closing price of $203. Ritholtz Wealth Management CEO Josh Brown owns Nvidia and believes the company has momentum going forward. On Tuesday's "Halftime Report" he said he would be a buyer here, and that "under $200 they're giving the stock away." 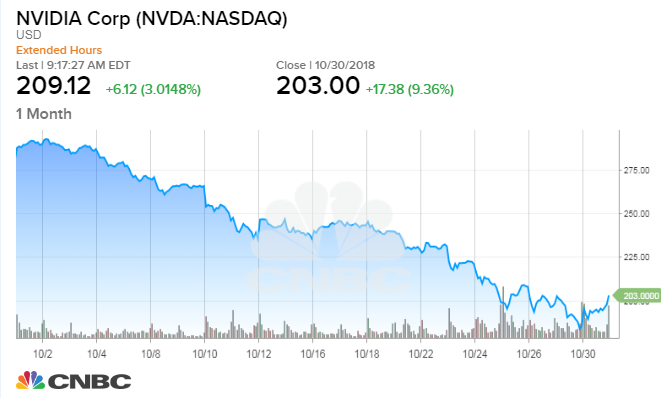 Nvidia hit an all-time intraday high of $292.76 on October 2, but it's plunged more than 30% since as investors have pivoted to more defensive trades amid concerns of stretched valuations in high-flying tech stocks. "I understand the reasons why it's down. I think a lot of it is just general selling of large cap technology stocks," Brown said. "And some of it is people concerned about various, in my opinion minor, issues about the chip market. But I would be a buyer here." At the beginning of the year Nvidia traded at 52X forward earnings, but the valuation has since come down to 24X. At this level Stephanie Link, managing director at Nuveen, which has $970 billion in assets under management, believes the stock is "getting quite interesting." "I don't know when the time is going to be to actually buy it. I think overall growth tech will have to stabilize. But I'm very interested in this one," she said. Elsewhere in the space Link is watching Xilinx, and is waiting for a pullback to buy the stock. "Xilinx had a wonderful quarter and that stock has held up quite well," she said. But not everyone believes that Nvidia's pullback is overdone. Virtus Investment Partners' Joe Terranova is staying away from the stock for now. "Nvidia is in free-fall...Why are you buying that near-term free-fall when you could buy a quality company like an Intel and play the same type of bounce...I think the market is more comfortable buying an Intel than it is taking a chance that AMD or Nvidia is going to experience some sort of a bounce," he said. Shares of Nvidia rose 9.36% on Tuesday, the company's best day since May 2017.